A faded movie actress commits murder. Lt. Columbo, one of her biggest fans, is on the case. Lt. Columbo: I had an uncle. He played bagpipes in the shriners band. He couldn't play a note, but nobody could tell the difference. Good and watchable but the movie gives you the feeling it all could had been done better. The movie is directed by Richard Quine, who simply isn't among one of the most talented directors who ever worked on a Columbo movie. 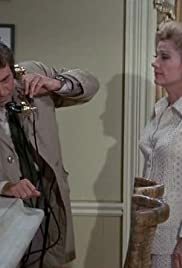 Despite this he directed a total of 3 Columbo movies, so he must have done something right in the mind of the creators and studio bosses or he must have had friends in right places. To me it seemed that he didn't really understood the Columbo character right and often overdid things involving the famous character, mostly with his intelligence and perception of things. He also in some ways differ from the usual Columbo formula, which just isn't always for the good. It isn't among the fastest going or best flowing Columbo movies but this is mostly being compensated by the acting and scenes with Anne Baxter and Kevin McCarthy. Both of them are a bit of forgotten stars, who also never reached true stardom but did their share of good movies and played some fine roles. It's mostly their movie, which also sort of means that Peter Falk is playing third violin in this one. This especially shows in the sequences when the three of them are together on screen. Another indication of that Richard Quine didn't really knew how to handle the character right (His car also looks dirtier than ever before by the way). It features a good and quite non-formulaic Columbo murder-mystery story that however due to its treatment and pace just never really gets of the ground. Some minor script changes and a different director at the helm could had made this a true great and original Columbo movie entry! It features a story that is set in the world of Hollywood and movie-making and therefor also features some good egocentric characters who think they own the world and can get away with anything, even murder. No it's really not one of the worst Columbo movies out there and it simply is just a bit below the usual Columbo movie standard in the long run and it's also definitely a big step up from Richard Quine's other Columbo movie "Columbo: Dagger of the Mind" but it still leaves you with the feeling that it all could had been done better, which makes this movie perhaps still somewhat disappointing to watch.